Out of the known minerals, the Iron Mineral is the most important because without it, nothing in this world could survive. Humans, plants and animals just could not live without the iron mineral. Iron is the most abundant mineral on earth and is present in many of the enzymes and proteins that are involved in keeping the body healthy. 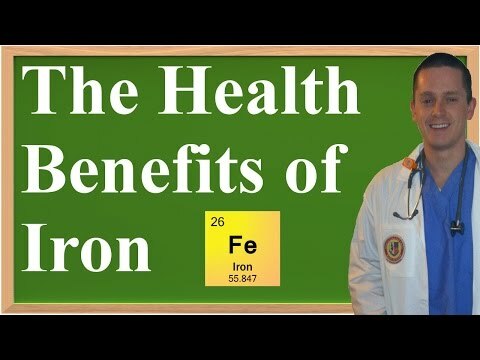 The human body reuses or conserves approximately 90% of its iron each and every day. The remaining 10% is eliminated and it is this 10% that must be replenished otherwise the body runs the risk of developing an iron deficiency. The major role iron plays is that of an oxygen transport assistant. It's found in the hemoglobin, a protein inside red blood cells that helps move oxygen out of the lungs so that it can be carried to the body parts that require it. Muscles, tissues and organs all need oxygen. The immune system needs iron too. Iron assists with the metabolization process and it's crucial in body's ability to regulate temperature. One interesting fact about iron is that it has the ability to regulate how much the body absorbs. When current iron levels are sufficient, no iron is absorbed. And that's good because too much can cause toxicity. When levels start to decrease, the body goes into iron absorption mode. Iron is present in both mother's milk and formula, but infants consume a much higher percentage of iron when they are breastfed. Infants that are not breastfed should be given iron fortified formula and/or cereal or an iron supplement. The hemoglobin contains two different types of iron which are heme iron and non-heme iron. The main difference between the two is the absorption capability. The body easily absorbs heme iron but absorbing non-heme iron is more difficult. Absorption rates of non-heme iron can be improved by including meat, fish and vitamin C to the diet. Another difference is the source of these two types of iron. Organ meats such as liver, heart and kidneys, and lean beef, fish, seafood, sardines, anchovies and poultry are good sources of heme iron. Plant sources provide much of the body's non-heme iron. Good sources include spinach, oat bran, apricots, kidney beans, hazelnuts, almonds, cashews, whole meal bread, eggs and soy products. Organ meats such as liver, heart and kidneys and lean beef, fish, seafood, sardines, anchovies and poultry are food sources that are rich in heme iron. Plant sources provide much of the body's non-heme iron. Some good sources include spinach, oat bran, apricots, kidney beans, hazelnuts, almonds, cashews, wholemeal bread, eggs, soy products and fortified cereals. Many other foods have been enriched with iron and this is important because most processed foods lose their natural iron supply. Pasta, bread made with refined flour, white rice and ready-to-eat cereals fall into this last category. Women over age 50 and all older men need 8 mg of iron/day. Any woman who has not yet started menopause needs more, 18 mg/day, compensate for the blood that is lost during a woman's monthly menstrual cycle. Women who are pregnant or who may become pregnant should also get more iron. Several situations can lead to an iron deficiency. In some people, their bodies are not able to absorb it properly. An iron deficiency can also result from a significant loss of blood whether from a wound or because of a woman's menstrual cycle. Finally, probably the most common reason for an iron deficiency is the diet. Very simply, many people do not consume adequate quantities of iron-rich foods. One of the most notable symptoms of an iron mineral deficiency is anemia. Its symptoms include fatigue, reduced mental capacity, insomnia, headaches, loss of appetite and an inability to maintain proper body temperature. An iron deficiency also diminishes the capacity of the immune system.